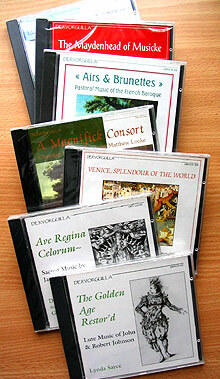 Dervorguilla was a UK record company specialising in Early Music. Established in 1991, it operated until closing down in good order in 1998. The company produced recordings of which we were very proud, and failed through lack of resources rather than any lack of enthusiasm. Recording, mixing, design and marketing were very largely handled by ourselves, and we were pleased to get some excellent reviews in Gramophone and Early Music magazines, etc. We believe that Dervorguilla was something of a pioneer in that we were only the third record company in the UK, to sell discs over the web. Many of those recordings were the first public presentation of the music (often dug from the recesses of Oxford's Bodleian Library), and of the artists concerned (Lynda Sayce, The Dufay Consort, Concordia, and the rising star of the harpsichord Gary Cooper, etc), and we have been tremendously pleased to watch the progress of those people in musical careers subsequently. This page has been posted in response to requests and queries about the recordings; copies of all but one of the CDs are available from Nick Daisley at the above contact address, on special request, and are priced to cover costs. At some point I will get around to developing the site to give details of the records. The spirit of the company lives on in the not-for-profit entity Folly Bridge Records http://www.follybridge.com, which does occasional recordings of folk and blues performers in and around Oxford, England. IT-Alternative is the host for Dervorguilla Records. Dervorguilla Ltd ceased to exist as a company and as a financial entity in 1998 - the records are being made available privately, to help defray some of the considerable costs of storage. All royalties, duties etc have long since been paid in full, and all the artists were offered discs either free or at cost price, prior to company closedown. If you have any questions or concerns about the above, please address them to Nick Daisley.